This is such a cute idea I saw in Good Housekeeping! I love this for a playroom or a little girls room. Take ribbon (I like what they did in the picture – gradient colors, and different patterns), measure the door frame where you’d like to hang the “curtain”, multiply that by two and add two or three inches. Fold the pieces in half, and pull the ends through the folded part around the rod. 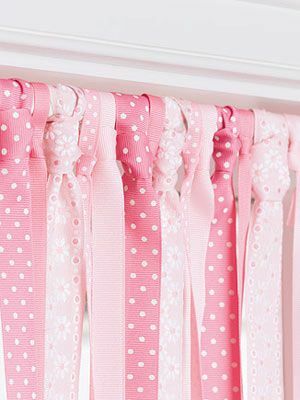 Hang the rod in the door and you’ve got yourself an adorable ribbon curtain for any room!